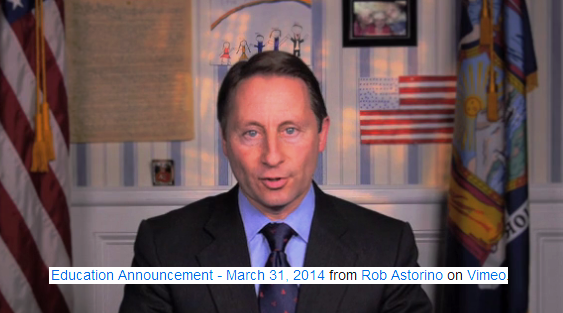 In the video, Astorino slighted the origin of the new Common Core standards. "Common Core didn't come from parents. It didn't come from teachers or school administrators. It came from [Bill] Gates and, later, Washington bureaucrats -- the geniuses who brought us Obamacare." Emily Karol with the Alliance for Quality Education responded to a request for comment by email, stating "We think it's the right of any family, including Astorino's, to opt out." Pro-charter school education reform group StudentsFirstNY Executive Director Jenny Sedlis countered, berating Astorino for using his children as political props. "Choosing to opt out of higher standards for New York students is a shockingly irresponsible thing for a statewide candidate to do. Governor Cuomo and the state legislature showed incredible leadership by standing up for the higher standards. Either Rob Astorino doesn't understand what it will take to prepare kids for today's economy, or he's purposely trying to score cheap political points." Astorino refers to the as standards "Cuomo's Common Core" and believes New York's parents and teachers will lose local control over classrooms. The governor for his part has called for Common Core rollout “flawed” and appointed a panel to review it. "Andrew Cuomo ate it up, calling it 'state-of-the-art.' New York fast-tracked Common Core, handing over the keys to your children's classrooms, without any knowledge of whether it would help or hurt our kids. You know why? Albany wanted the federal dollars, which will soon run out. So we're risking our children's futures for a few scraps from Washington." Several parent groups argue Common Core is causing undue stress on children by emphasizing competitive test scores over the well-being and individual learning needs of students. Lisa Rudley is co-founder of the New York State Allies for Public Education. "As we are increasing test-driven environments, parents across the state are saying 'no more' and we're seeing record numbers of parents opting out their children from these state tests." Neither the Cuomo Administration nor the Board of Regents returned calls for comment. New York Republican gubernatorial candidate Rob Astorino has told an evangelical audience that the political left wants to take away their freedoms. The Westchester County executive spoke Tuesday in Albany to a meeting of the New Yorker's Family Research Foundation. Astorino has focused his campaign on economic issues, but told the evangelicals they must push back against the political left. He later cited the health care act's mandates on religious organizations as an example. ALBANY, N.Y. (AP) — A top county official from New York City's northern suburbs is officially launching his uphill fight to unseat New York Democratic Gov. Andrew Cuomo. New York State lawmakers say it’s likely the state budget will include a moratorium on the effects of school exams administered in connection with the controversial Common Core learning standards.